In the 1960s, Frits Lugt started to pay more attention to the conservation of the collection of works on paper in his new premises at 121 rue de Lille, Paris. He enlisted the help of graphic art restorer Peter Poldervaart to take charge of restoration and mounting. Poldervaart worked there for several years before becoming Head of the paper conservation department at the Rijksprentenkabinet in Amsterdam. In 1970, the new director Carlos van Hasselt introduced the conservation methods used in Dutch museums. Mount-making was transformed by the acquisition of high-quality cardboard from Holland. 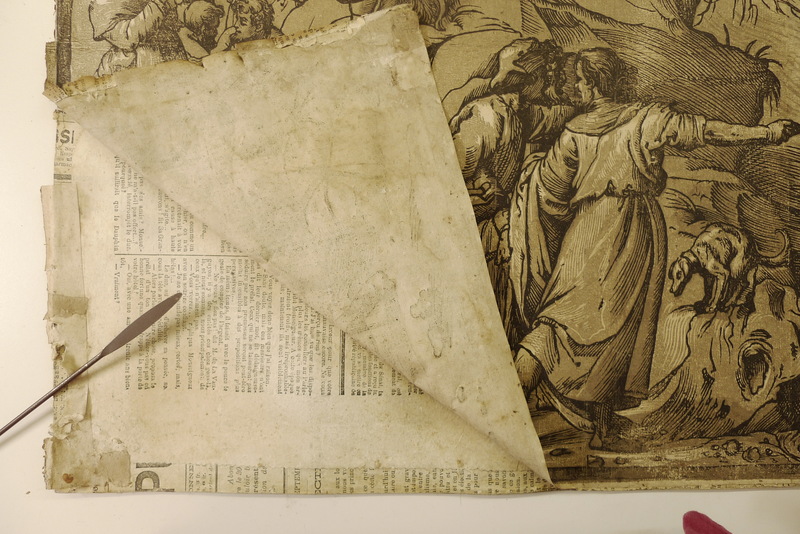 In 1973, Carlo James took over the material conservation of prints and drawings. He first devoted his attention to the collection of prints, still mainly mounted on acid paper and stored in boxes and folders of inadequate quality, or glued into albums. Henceforward the prints were to be kept in ivory-coloured mounts, in standard-sized conservation boxes. From 1980, Carlo James taught in the conservation department at IFROA (now the Institut national du Patrimoine). His studies on the conservation of prints and drawings have been published in a number of books and articles (see E-Newsletter no. 3, December 2012, p. 16). In 2005, Corinne Letessier, one of his former students from the Institut National du Patrimoine, replaced Carlo James. Since then, a new approach to preventive conservation has been integrated into the activities of the workshop, which now also deals with climate control in exhibitions, the management of the reserves, the evaluation of the state of the collections and the drawing up of condition reports for loans; also within the workshop’s remit is the establishment of emergency measures and the organisation of campaigns for conservation and preservation (see E-Newsletter no. 5, July 2013, p. 25 and E-Newsletter no. 7, July 2014, p. 32). 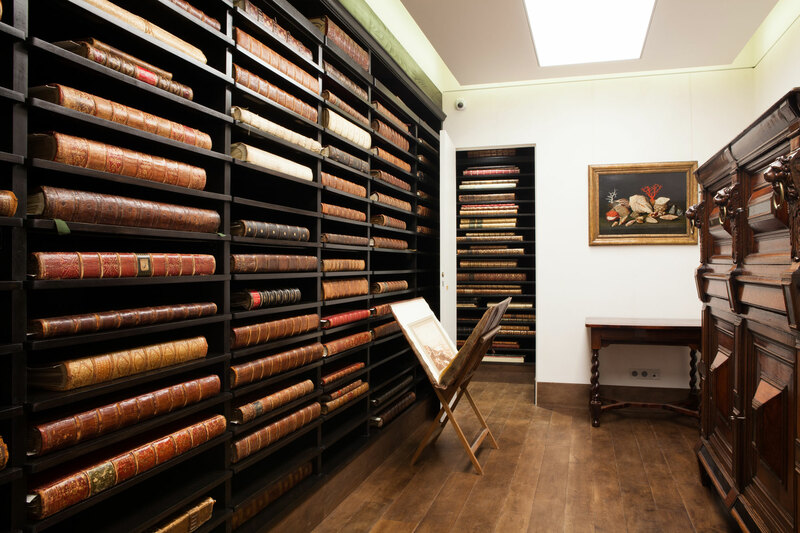 The collection of Old Master drawings, all dating from before the mid nineteenth century, has been kept since the outset with the specific intention of recreating the atmosphere of a collector’s print cabinet. The mounts, made of hand-coloured cardboard, are inserted into authentic Italian, French and Dutch albums of the sixteenth to nineteenth centuries; the blank pages are either original or have been replaced with contemporary paper of good quality. The cardboard used is thin so as not to cause damage to the bindings. This mode of storage was chosen by Frits Lugt. Nowadays it has to comply with current norms: stable materials must be used and handling has to be secure. Conservation work today demands a compromise between aesthetics and preservation. In accordance with the wishes of our founder, during temporary exhibitions drawings are sometimes presented in antique frames (see the publication Framing Rembrandt and his Circle, Institut Néerlandais, 2011). This process involves very labour-intensive preparation: coloured mounts are made to measure, and frames are restored and issued with a condition report before transport. The choice of this method of presentation singles the Fondation Custodia out from other institutions, which are more likely to choose a neutral presentation. With regard to the collections of prints and drawings dating from later than the mid nineteenth century, traditional mounts with a window, and a cardboard background are gradually being replaced by rigid, air-tight folders in compliance with the latest Dutch research into the mounting of graphic works of art. This method controls the impact of the micro-environment inside the storage boxes (see E-Newsletter no. 5, July 2013, p. 25). Collaboration with training establishments, initiated by former directors, continues today. Courses are offered at the Fondation Custodia to conservation students from the École du Louvre, as well as to museum professionals (curators, managers) (see E-Newsletter no. 1, June 2012, p. 10). When restorers are being taught, the emphasis is on observation. This is a basic requirement of the profession: it trains students in the development of the technical expertise necessary as an adjunct to the perceptions of art historians. The existence of this workshop reflects the importance given by the Fondation Custodia, since its inception, to one of the most important aspects of its mission: the material conservation of works of art and technical knowledge of those works.